This tutorial assumes basic knowledge of Vue. If you haven't worked with it before, then you may want to check out this CSS-Tricks guide on getting started. You can get the code samples from Github. Why Should I Render to a Server? If you already know why you should server-render and just want to learn about routing or route protection, then you can jump to Setting Up a Nuxt.js App from Scratch section. Interactive user interfaces were such nightmares to build using these patterns. In addition to the amount of work you had to do with the DOM via JS, you still needed to do the dirty jobs of poking the DOM, traversing it, and forcing contents and features into it. Worse still, this led to a lot of bad code and poor performing (slow) UIs. 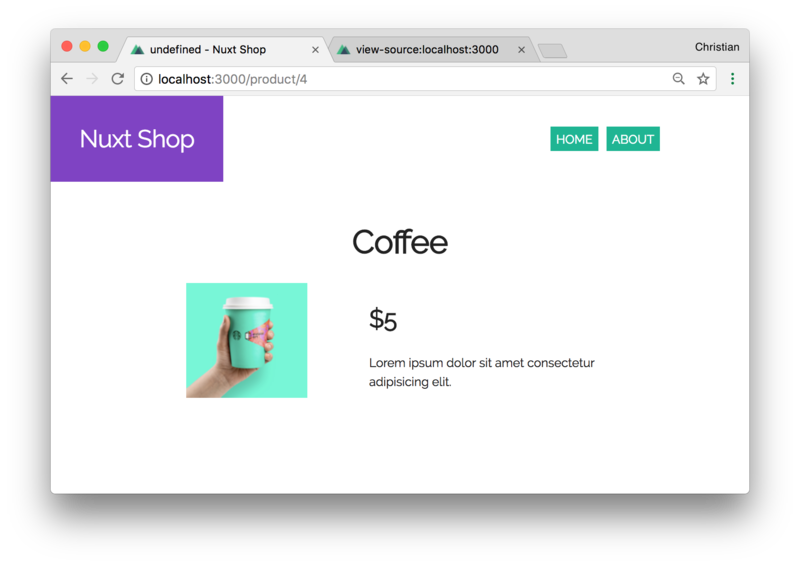 Nuxt.js is an option to what Vue already offers. It builds upon the Vue SSR and routing libraries to expose a seamless platform for your own apps. 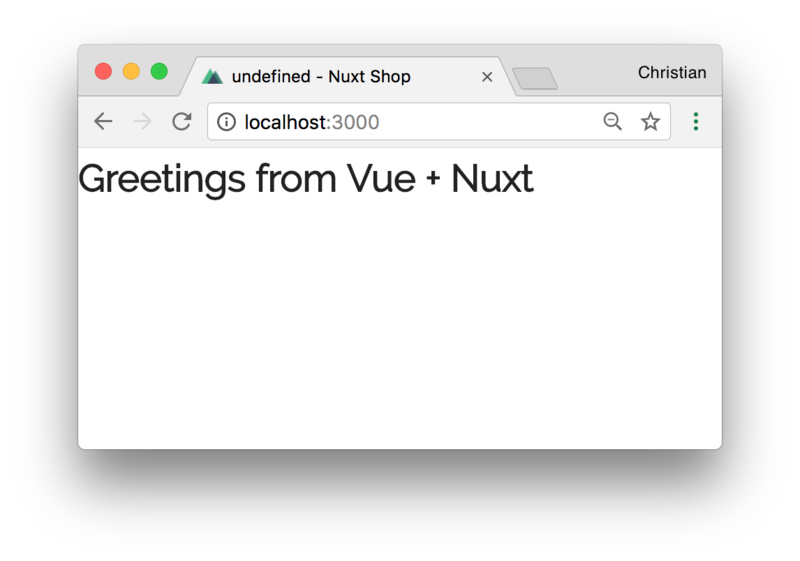 Nuxt.js boils down to one thing: to simplify your experience as a developer building SSR apps with Vue. We already did a lot of talking (which they say is cheap); now let’s get our hands dirty. But that’s not the deal, and we want to get our hands dirty. This way, you would learn the underlying processes that powers the engine of a Nuxt project. The name property is the same as the name of the folder you working in. 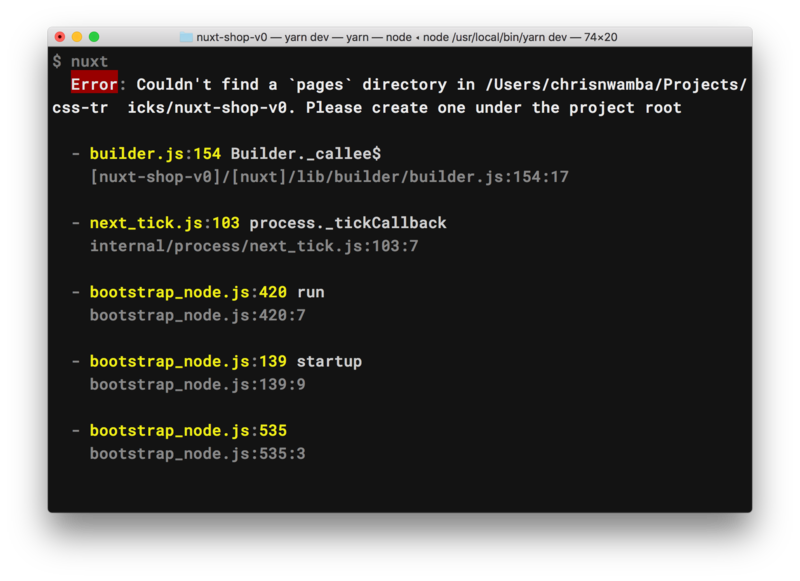 Nuxt.js maps page routes to file names in the pages folder. This implies that if you had a file named index.vue and another about.vue in the pages folder, the will resolve to / and /about, respectively. 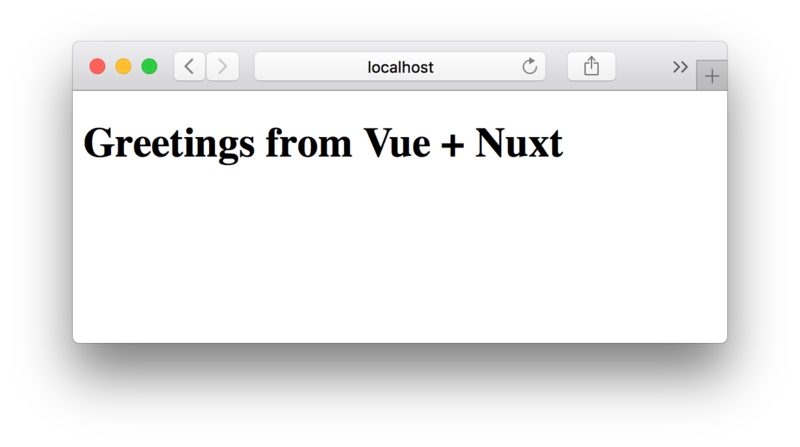 Right now, / is throwing a 404 because, index.vue does not exist in the pages folder. assets: Files here are webpacked (bundled and transformed by webpack). Files like your CSS, global JS, LESS, SASS, images, should be here. static: Files here don’t go through webpack. They are served to the browser as is. Makes sense for robot.txt, favicons, Github CNAME file, etc. We just defined our title template, page meta information, fonts, favicon and all our styles. 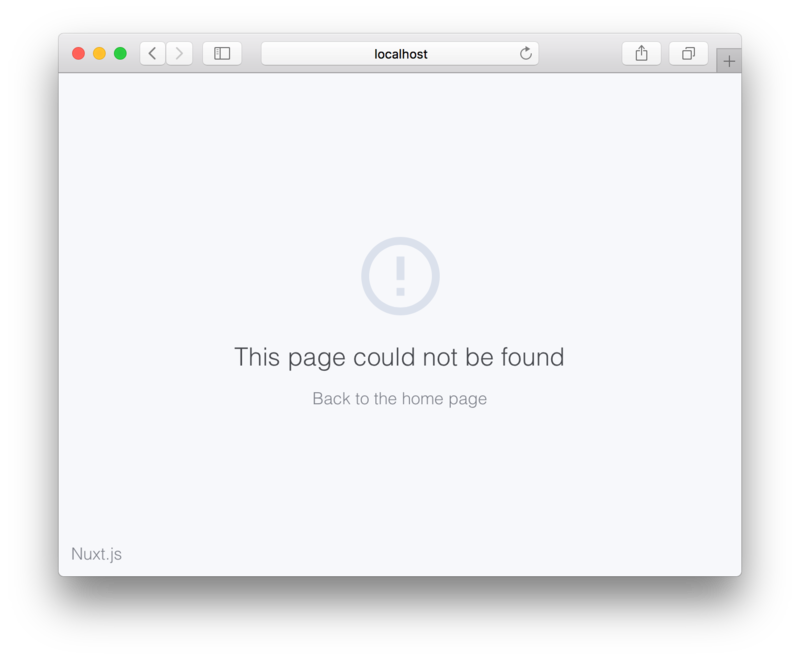 Nuxt.js will automatically include them all in the head of our pages. I am omitting all the styles in the style tag but you can get them from the code repository. I omitted them for brevity. 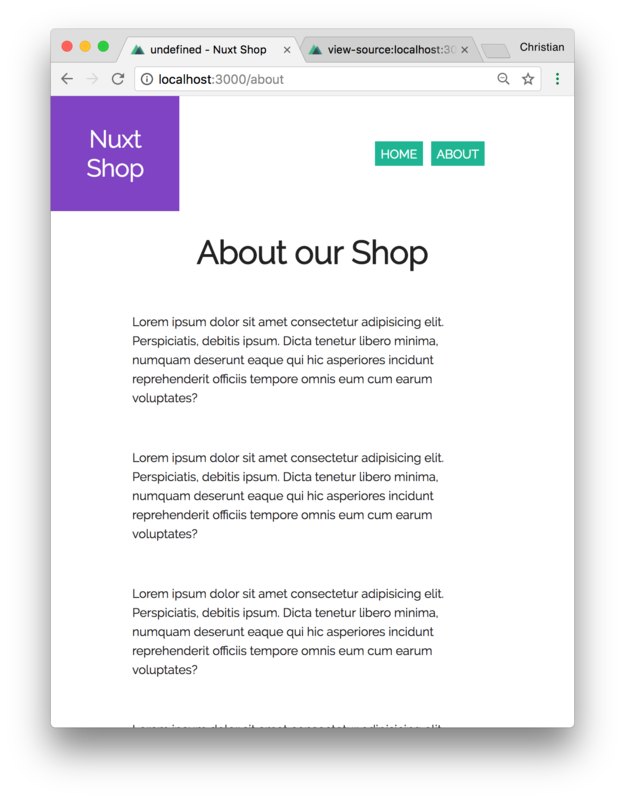 The layout file is also a component but wraps the nuxt component. Everything in the this file is shared among all other pages while each page content replaces the nuxt component. Speaking of shared contents, the app-nav component in the file should show a simple navigation. This is what I prefer to refer to as implicit routing. bundle.js. This would be the expectation when using webpack. In plain Vue projects, this is what we get and we would manually split the code for each route into their own files. With Nuxt.js, you get this out of the box and it’s referred to as automatic code splitting. You should take out one thing from this: Routes === Pages. Therefore, you’re free to use them interchangeably in the server-side rendering world. This is where the game changes a bit. In plain Vue apps, we would usually wait for the component to load, then make a HTTP request in the created lifecycle method. Unfortunately, when you are also rendering to the server, the server is ready way before the component is ready. Therefore, if you stick to the created method, you can’t render fetched data to the server because it’s already too late. For this reason, Nuxt.js exposes another instance method like created called asyncData. This method has access to two contexts: the client and the server. Therefore, when you make request in this method and return a data payload, the payload is automatically attached to the Vue instance. // Truncated for brevity. See repo for full code. Ignore the imported components and focus on the asyncData method for now. I am simulating an async operation with setTimeout and fetching data after two seconds. The callback method is called with the data you want to expose to the component. Now back to the imported components. You have already seen the <h1> component. I have created few more to serve as UI components for our app. All these components live in the components directory and you can get the code for them from the Github repo. 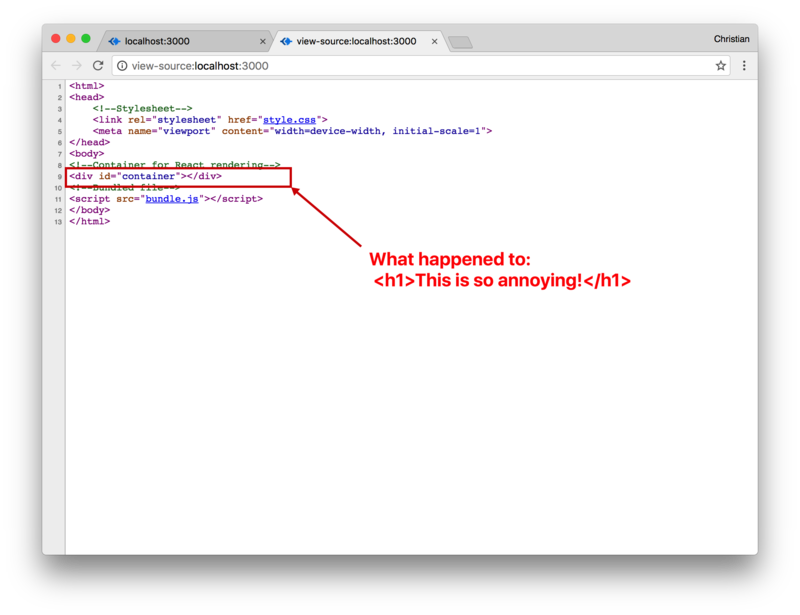 Rest assured that they contain mostly HTML and CSS so you should be fine understanding what they do. Guess what? The fetched data is still rendered to the server! The value 2 in the URL can be 3 or 4 or any value. The most important thing is that your app would fetch that value and run a query against a dataset to retrieve relative information. What’s important is the asyncData again. We are simulating an async request with setTimout. The request uses the id received via the context object’s params to query our dataset for the first matching id. The rest is just the component rendering the product. It won’t take too long before you start realizing that you need to secure some of your website’s contents from unauthorized users. Yes, the data source might be secured (which is important) but user experience demands that you prevent users from accessing unauthorized contents. You can do this by showing a friendly walk-away error or redirecting them to a login page. In Nuxt.js, you can use a middleware to protect your pages (and in turn your contents). A middleware is a piece of logic that is executed before a route is accessed. This logic can prevent the route from being accessed entirely (probably with redirections). The middleware checks if a method, isAuth, returns false. If that is the case, it implies that the user is not authenticated and would redirect the user to a login page. The isAuth method just returns false by default for test purposes. Usually, you would check a session to see if the user is logged in. Don’t rely on localStorage because the server does not know that it exists. This automatically shuts this page out every single time we access it. This is because the isAuth method is always returning false. I can safely assume that you have learned what SSR is and why you should be interested in using it. You also learned some fundamental concepts like routing, layouts, security, as well as async data fetching. There is more to it, though. You should dig into the Nuxt.js guide for more features and use cases. If you’re working on a React project and need this kind of tool, then I think you should try Next.js. You did a great job with this post. It’s so thorough and a fantastic explanation. Nice work! Thank you so much, Sarah. Glad you loved it! Nicely detailed. Learnt a lot from this post. Great Job. So one thing I’ve been struggling with is what can be done server side. As an example, when I first tried to use Nuxt, I switched out Axios to request-promise. In my mind, Nuxt was rendering everything on the server, so I should be able to use any Node module I wanted. (You can see the issue I raised here: https://github.com/nuxt/nuxtjs.org/issues/106). So given that you need to be isomorphic, how would a user session work? As you said, you can’t use localStorage as it’s being rendered on the client, so… how would you handle that? 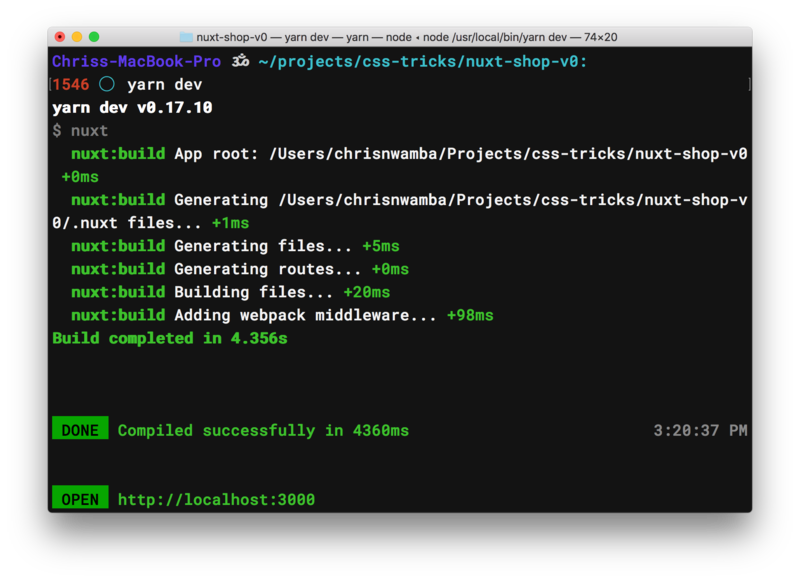 Also, doesn’t that break down if the Nuxt app is generated staticly? Thank you for the great write up! Are you aware of any tutorials on deploying a Nuxt app to a production environment, lets say, digital ocean? Another great post Chris – Many thanks! 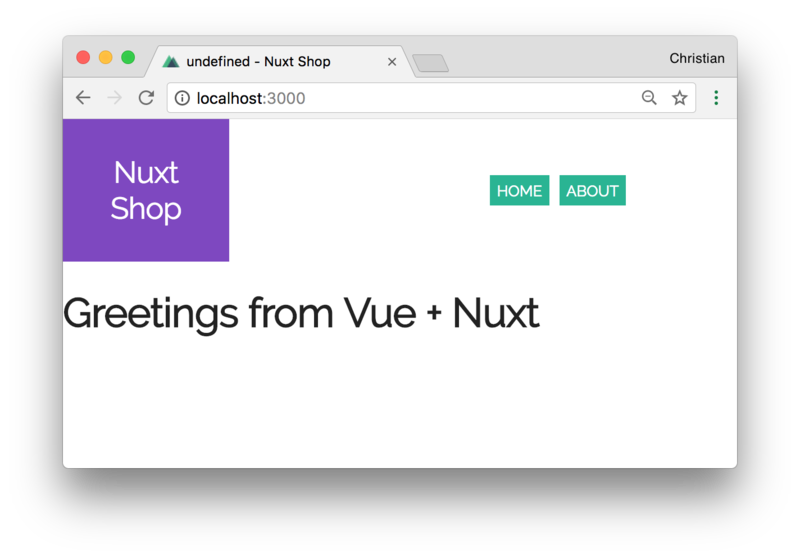 In particular, I realised I had misunderstood the Nuxt documentation in regard to Props and Vuex with store. 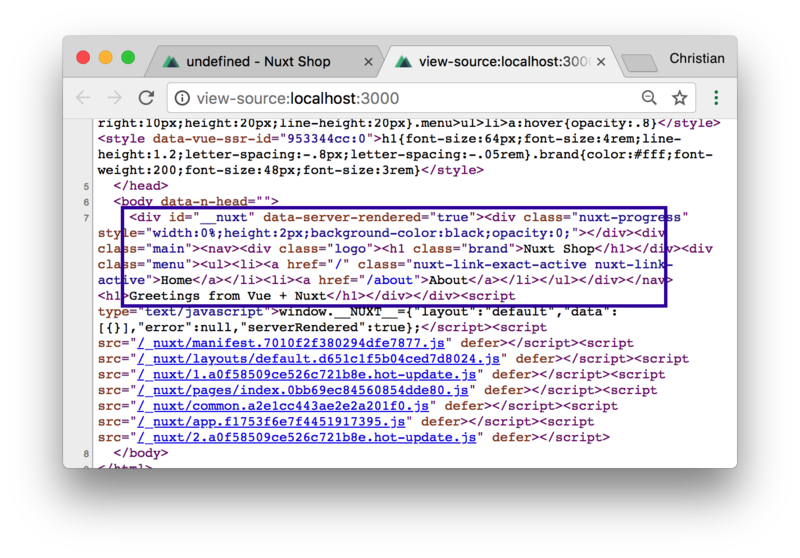 I hadn’t been able to get Props to work in my Nuxt prototyping and incorrectly (I now see from your code) concluded from the nuxt.org examples that vuex store was the only way to communicate down the component hierarchy – sometimes rather heavy overhead for the sort of transfers you needed in your h1, h2, button etc components. So glad that Props can be used but I think, not for s, only component ‘calls’. Having said that, Vuex and store and the new modules capabilities appear very powerful but quite complex/tricky to use. 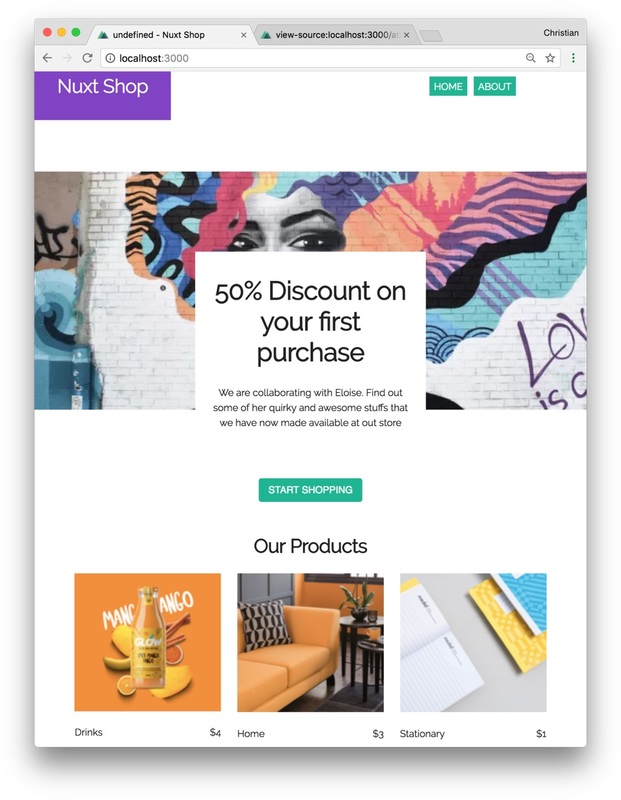 That would be a wonderful subject for a new post by one of you Nuxt experts as the nuxt.org shopping-cart example, for me, lacks detailed explanation. A couple of other related issues as the possibilities widen using Nuxt are first, having nuxt-linked to a new page and navigated up and down the SPA hierarchy on that page, how do you programmatically return to the original page, and secondly, without wanting a single monolithic Nuxt program for a hierarchy of projects/modules, is there a way for example in the Nuxt components and pages folders to ‘point’ to other drives, folders and files on your machine, so not necessarily directly containing them in the Nuxt project folder structure?